The GAU-LTL-150W-LED High Mast LED Flood Light offers intense light output and is ideal for flood lighting, high mast lighting, light towers, as well as industrial and outdoor lighting applications. Producing 20,250 lumens, a 1.25 amp draw at 120V, 80,000 hour service life, 120-277 volt compatibility, and IP67 waterproof rating, this LED flood light provides operators with a rugged and powerful LED alternative to 400 watt metal halide lamps that uses little power and can withstand rugged use and abusive conditions. The GAU-LTL-150W-LED LED light from Larson Electronics produces 20,250 lumens of high intensity light while drawing only 150 watts at 1.25 amps from a 120 volt electrical system. Sixteen CREE® high output LEDs producing 1,350 lumens each are arranged in rows and paired with PMMA high purity optics to produce a well focused 24° wide spot beam that is ideal for providing far reaching concentrated illumination while still covering a substantial amount of area. We also offer optional optics with 10° spot, 38° narrow flood, 60° flood, and 90° wide flood beam spreads. The spot beams are tightly focused and are designed for high elevation mounting to achieve distance, making spot versions ideal for high mast and spots lighting. The flood beams are designed to provide more light over a larger area nearer the fixture, making flood versions ideal for use as dedicated work and area lights. GAU-LTL-150W-LED lights are ideal replacements for fragile and hot running 400 watt metal halide lamps. They offer low power requirements, high durability and a versatile mounting system that makes these LED light emitters a superior lighting solution for demanding applications where power and reliability is critical. 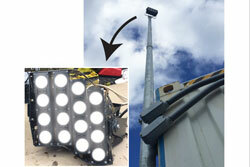 The heavy duty design and high power of these LED lights also makes them suitable for a wide array of applications including but not limited to: high mast lighting, light towers, light plant LED retrofits, military, mining, industrial manufacturing, machine visioning, security and law enforcement, commercial structure illumination, sport complexes, billboards, race tracks, and parking lots to name a few. Durability: As well as unparalleled heat control, the GAU-LTL-150W-LED series of LED lights from Larson Electronics also offer IP67 rated construction that is designed to withstand extremes of environmental and operating conditions. These units can withstand rapid temperature changes of -40° Celsius to +80° Celsius, are waterproof, and resist ingress of dust, dirt and humidity. The housings are formed from die cast aluminum and the optics are high transmission PMMA with 98% light transmittance. The CREE® LEDs help these units achieve resistance to vibrations and are rated at 70% lumen maintenance after 80,0000 hours of use. We recommend these LED lights for use in applications where a lot of vibration, dust, dirt, dampness and abusive working conditions are encountered.